The African Union summit in Ethiopia has demanded a deferral of The Hague trial of Kenyan President Uhuru Kenyatta, due to start in November. It also agreed a resolution stating no sitting African head of state should appear before an international court. Senior figures including Kofi Annan have criticised plans to quit the ICC. When I asked people in Kenya last month what they thought about their president going to The Hague many didn't know how to answer, saying simply that it was a strange situation. It is indeed - and people can be forgiven for not knowing quite how to react. And now it has just become more complicated. Although Mr Kenyatta has always said he will co-operate with the court, this AU ultimatum definitely gives him political wriggle-room. If he is to resist going to The Hague until the end of his presidential term, what will people feel if he wants to stand again and campaigns for a second mandate on a nationalist card of non-attendance at the ICC? And another complication: the Kenyan constitution says he is immune from national courts but has to follow the edicts of international ones. This whole affair is breaking new ground; expect more confusion in Kenyan hearts. Both he and his deputy, William Ruto, deny charges of organising violence after the 2007 election. While Mr Ruto went on trial in September, President Kenyatta has repeatedly requested his trial - due next month - be postponed. 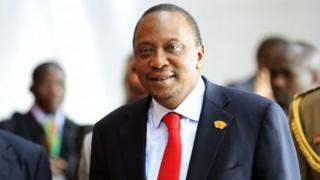 Addressing the summit, Mr Kenyatta accused the court of bias and "race-hunting", AFP reports. "The ICC has been reduced into a painfully farcical pantomime, a travesty that adds insult to the injury of victims. It stopped being the home of justice the day it became the toy of declining imperial powers." Ethiopian Prime Minister and AU chairman Hailemariam Dessalegn said the summit was not a crusade against the ICC but a call for the court to address Africa's concerns seriously. He said the ICC's cases against the Sudanese and Kenyan presidents could hamper peace and reconciliation efforts in their countries. "The unfair treatment that we have been subjected to by the ICC is completely unacceptable," he said. Ethiopian Foreign Minister Tedros Adhanom Ghebreyesus, who is the current chairman of the AU's Executive Council, said the ICC had failed to respond to the African Union's previous complaints. "What the summit decided is that President Kenyatta should not appear until the request we have made is actually answered," he said. Thirty-four of the AU's 54 members have signed up to the ICC. Kenya's parliament has already passed a motion for the country to withdraw. Former UN Secretary-General Kofi Annan has said that withdrawing from the court would be a "badge of shame". "Those leaders seeking to skirt the court are effectively looking for a license to kill, maim and oppress their own people without consequence," he wrote in an article carried by several newspapers. "They simply vilify the institution as racist and unjust, as Hermann Goering and his fellow Nazi defendants vilified the Nuremberg tribunals following World War II."